Where will Roy end up? Let us know! 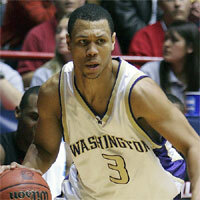 How can Brandon Roy best be described? In a word, versatile. The 6-foot-5 Roy does just about everything well, averaging 12.8 points, 5 boards and 2.2 assists as a junior. However, it wasn't until his senior season that he exploded on to the scene, upping his averages to 20.2 points on 50.8% shooting, 5.6 boards, 4.1 assists and 1.4 steals, while hitting over 40% from long range. Named the Pac-10 Player of the Year, Roy led the Huskies to a 26-7 record and a spot in the Sweet 16 and is a sure-fire lottery pick in the 2006 NBA Draft. Smart player -- doesn't take many bad shots or force the issue. Roy does just about everything well. Very good midrange game. Has good handles and court vision and is able to create for teammates. Solid free throw shooter. Has a good first step and is very effective getting to the basket. Great work ethic which has paid off in his shooting. His foot speed is one big question, and how it will impact him on defense. Despite shooting just over 40% from three as a senior, his shooting is a question for many. He will have to add some beef to his frame in the NBA. Not a bad athlete, but doesn't blow you away with his athleticism. Brandon Roy on the Houston Rockets? Roy would be a tremendous addition to Houston. Though he still needs to bulk up to be more effective at this level, Roy, at 6-foot-5, would give the Rockets more defensive size that they desperately crave out of the two. His versatility on both ends of the floor would certainly make Jeff Van Gundy's job a lot easier. This is a smart, skilled player who, if drafted by the Rockets, could become their starting two guard for years.